The purpose of this unit is to help the candidate to understand the value of the ITIL service lifecycle, how the processes integrate with each other, throughout the lifecycle and explain the objectives, scope and business value for each phase in the lifecycle. 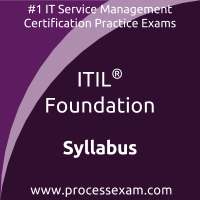 The purpose of this unit is to help the candidate understand how the service management processes contribute to the ITIL service lifecycle, to explain the purpose, objectives, scope, basic concepts, activities and interfaces for four of the core processes, and to state the purpose, objectives and scope for eighteen of the remaining processes. The purpose of this unit is to help the candidate to explain the role, objectives and organizational structures of the service desk function, and to state the role, objectives and overlap of three other functions. The purpose of this unit is to help the candidate to account for and to be aware of the responsibilities of some of the key roles in service management.